Home›Anime News›"DYNAMIC CHORD" Anime Debuts the Boys of "apple-polisher"
"DYNAMIC CHORD" Anime Debuts the Boys of "apple-polisher"
The boys of the internationally famed apple-polishers — well, internationally famed in the word of DYNAMIC CHORD — have appeared to introduce themselves. The anime adaptation of the popular otome game comes out next month, and this four-member unit is the latest to get character art to show off to its adoring fans. From left to right, the unit consists of UK (CV: Yoshiki Nakajima), vocalist NaL (CV: Shouta Aoi), drummer Toi (CV: Takahiro Sakurai), and bassist and group leader Kuro (CV: Yuichiro Umehara). NaL has already appeared on the series’s key visual, along with the vocalists for the other three bands. 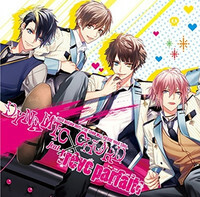 DYNAMIC CHORD follows a record company of the same name, which produces four four-member male bands. The new series will take place a few years after the original game. It starts airing on TOKYO MX October 5. Sentai Filmworks Licenses "Dynamic Chord"
Kakuriyo no Yadomeshi Ep. 15 is now available in OS. Creatures of the Night Return in "Vampire Princess Miyu – Saku"